Now that digital imagery circulates at lightning speed, the printing press may seem like ancient technology. Yet well before the advent of photography, printmakers’ innovations revolutionized the reproduction and distribution of images. Paper Museums traces the history of reproductive prints—that is, prints which reproduce other works of art—from their rise in Germany and Italy to their flourishing in the Netherlands, France, and England. 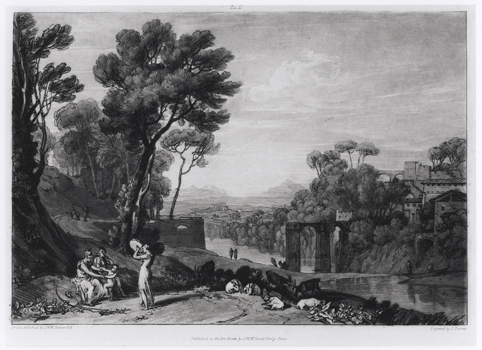 The exhibition features prints by and/or after Dürer, Michelangelo, Raphael, Rubens, and Watteau, along with celebrated sets by Claude Lorrain and J.M.W. Turner, among many others. Relatively inexpensive and readily transportable, reproductive prints allowed broader audiences to become familiar with the paintings, sculptures, and other works previously available only to royalty, wealthy travelers, and collectors. Organized in five thematic sections, Paper Museums opens with an introduction to the various ways prints transmitted ideas and styles. Section two explores the paradoxical role played by reproductive prints in relaying notions of truth and authenticity. The third section illustrates how reproductive prints disseminated the imagery of antiquity and contributed to the creation of a classical canon. Part four focuses on the use of prints to promote the fame of artists and collectors. The exhibition concludes with an examination of the social organization of print workshops, highlighting the important contributions of women printmakers. Challenging time-honored assumptions about art, Paper Museums sheds light on past perceptions and raises issues still relevant today. Revealing the often complex relationships between “original” works of art and “reproductions,” it offers new perspectives on a previously overlooked and underappreciated body of work. Also on exhibit on the lower level is Room with a View: Paintings by Andrea Facco, an installation by a contemporary Italian artist that, like Paper Museums, addresses the circulation of images in visual culture. Paper Museums is organized by the Smart Museum of Art at the University of Chicago and curated by Rebecca Zorach and Elizabeth Rodini. The exhibition is generously supported in part by the Andrew W. Mellon Foundation, the Samuel H. Kress Foundation, the Rhoades Foundation, and the Adelyn Russell Bogert Endowment Fund of the Franke Institute for the Humanities, University of Chicago. Smart Museum exhibitions are also generously supported by Tom and Janis McCormick and the Kanter Family Foundation and Nuveen Investments. The presentation of Paper Museums and Room with a View at the Grey Art Gallery is made possible in part by the Abby Weed Grey Trust. Public programs are supported by the Grey’s Inter/National Council. Special thanks to George Way, Staten Island, for his generous loan of the decorative arts on view. Like many northern European artists in the sixteenth century, the Dutchman Hendrick Goltzius traveled south to Rome to study classical sculptures firsthand. His forty-three surviving drawings after antique statuary from this trip appear to have been intended for a portfolio of reproductive engravings. 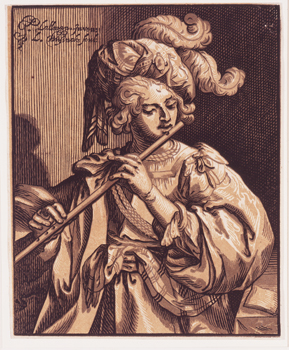 In the end, however, Goltzius engraved only three plates, which were not printed until shortly after his death. 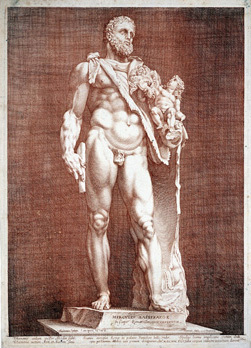 This engraving—said to represent the second-century Roman emperor Commodus, son of Marcus Aurelius, in his preferred guise as Hercules—is an eighteenth-century impression in red ink. 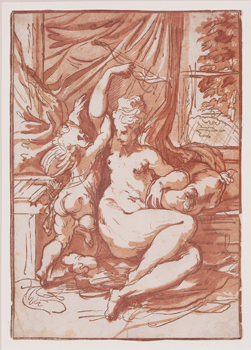 It may have been printed this way to mimic Goltzius’s original drawing in red chalk, a medium very pleasing to Rococo tastes. Parmigianino depicted Venus disarming Cupid on many occasions and in many variations. Jackson’s chiaroscuro woodcut emphasizes image over medium, effectively capturing the grace of the original drawing without striving to emulate its pen-and-ink medium. Its success demonstrates that a print refusing to masquerade as a drawing can nevertheless eloquently convey the look and feel of its model. Signatures and inscriptions on Ludolph Büsinck’s works attest to his collaboration with the French artist Georges Lallemand, who was Nicolas Poussin’s teacher. 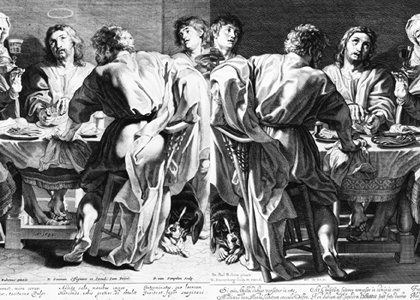 A German painter and printer, Büsinck stimulated interest in chiaroscuro woodcuts in early seventeenth-century France. While living in Paris from 1623 to 1630, he made prints almost exclusively in this technique, usually working after drawings by Lallemand. The formal importance of the elaborate scrolling inscriptions in The Flute Player, placed prominently at the upper left, reflect the care artists took to claim credit for and guard their work. Rubens harnessed the power of reproductive printmaking to boost his reputation, attract new commissions, and provide additional income. In order to ensure fidelity to his original works, he not only hired and supervised his printmakers, but also retouched their proofs. In his print after the Supper at Emmaus, on view nearby, Van Swanenburg—one of Rubens’s first engravers—captures the strongly sculptural quality of the painter’s early work. Van Sompel’s later etching transmits the softer quality more often associated with Rubens. Comparing this pair, note how the reproductive engravers—rather than merely “copying” the painting—made critical decisions about framing, tonality, iconography (Sompel added a halo), inscription, emphasis, and mood.